Reflecting on 2015, much progress was made. BikeBrampton members can be proud our advocacy made a difference. Community Bike Centre was created in partnership with Region of Peel and Community Environment Alliance. CBC ran a number of programs in 2015 including BikeWrx mechanics training and Pedalwise cycling mentorship to encourage public participation in active transportation. 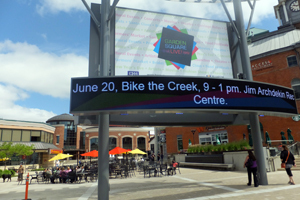 Two community bike rides including Bike the Creek and Bramalea CycleFest 2015 encouraged close to 600 participants to ride on Brampton’s trail network. Bicycle Friendly Business Program was launched in July in partnership with Share The Road Cycling Coalition. The BFB program aims to recognize those employers in Brampton who support and encourage their employees and customers to use active transportation to and from the workplace. We now have 2 Bronze level Bicycle Friendly Businesses including: City of Brampton and Region of Peel. Brampton Kids on Bikes project in partnership with the Heart and Stroke Foundation created a lot of awareness and support for student active transportation in Brampton and Peel Region. Peel Public Health has increased efforts to promote school travel planning programs and Peel Police in concert with a number of stakeholders, including the school boards have produced a series of videos extoling the virtues of student active transportation. City of Brampton has created and filled the position of Project Manager, Active Transportation. It has also created a citizens Cycling Advisory Committee as an official Committee of Council. These actions indicate greater awareness and support for active transportation in the City. Both the City and Region have made investments in improved active transportation infrastructure during the last year. Bike lanes have been installed at County Court and Grenoble Boulevards, urban shoulders and sharrows have been installed along McMurchy south of Queen. And Dixie Road from Bovaird to Steeles has seen major improvements and extentions to the pathway network. All of these things bode well for more good things to come in 2016 and beyond! Warmest wishes for a happy, healthy and safe 2016!